Genevieve Le Thiel (Brigitte Bardot) is a nice, well brought up girl from an upper class family. When she leaves her Paris home to settle an inheritance in Dijon she finds a young man, Renaud (Robert Hossein) who has attempted to commit suicide in her hotel room and saves him just in time. She ends up falling in love with Renaud, who appears to be no good for, her and despite her mother's disapproval and warning from his own friends, Genevieve refuses to break with her lover. Nothing seems to swerve Genevieve from her own self-destructive course, yet as Renaud keeps repeating that love is a bottomless pit, perhaps he too, will be engulfed by it. Love on A Pillow (Le repos du guerrier), aka Warrior's Rest is an early feature from one Roger Vadim, made 7 years after his debut hit And Woman... Was Created (1956), the first of his collaborations with his then wife Brigitte Bardot, who also stars here. A little seen film that was previously released as part of a 5-film Brigitte Bardot Collection, when Tim Lucas in Sight & Sound had this to say of the film: "it isn't particularly distinguished as cinema, yet its human dimension is unusually complex and compelling, riveting one's attention until the disappointing finale." Intriguing. 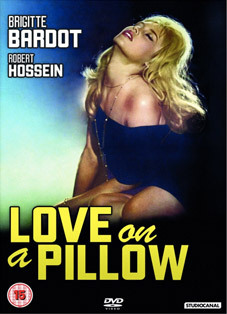 Love on a Pillow will be released on UK DVD on 19th March 2012 by Studiocanal at the RRP of £15.99.